Carlton’s Chris Judd and North Melbourne’s Jack Ziebell have been suspended by the AFL Tribunal. Judd was hit with a four week ban for causing intentional misconduct against Kangaroo Leigh Adams. The Blues skipper insisted that he did not intend to hurt Adams, however the Tribunal jury disagreed. Judd was hit with a penalty of 450 points, resulting in a four-match ban. Carlton said that they were disappointed with the result but decided not to challenge on Wednesday Afternoon. Judd admitted that his action was unacceptable, but again reiterated after the hearing that he never intended to hurt Adams and that he was trying to assist teammate Andrew Carrazzo in stripping the ball from the Kangaroo. 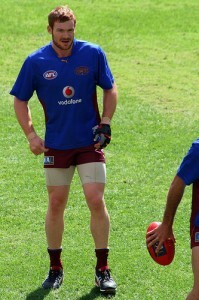 The two-time Brownlow Medallist now has another charge to add to his record, which includes eye gouging former Hawk and now Gold Coast hard man Campbell Brown in 2007, which he was cleared of, and making unnecessary face contact during the 2009 Finals Series with former Lion Michael Rischitelli. North Melbourne’s Jack Ziebell was also rubbed out for four matches. The Kangaroos young gun was originally offered a three-match ban by the Match Review Panel, but decided to try his luck at the Tribunal. Ziebell was cited for a rough conduct charge on Carlton’s Aaron Joseph during the second quarter of Friday Night’s match. North Melbourne have already announced that they will not challenge the Tribunal’s decision. Teammates took to twitter to vent their anger, with Drew Petrie tweeting “Advice for @JackZiebell. Stop being so courageous and playing footy hard the way it’s meant to be played. Please turn into a softy.” Rookie Majak Daw also retweeted an angry Kangaroos’ fans tweet. Earlier in the night, Brisbane’s Daniel Merrett also faced the Tribunal and escaped a level-two charging offence against St Kilda captain Nick Riewoldt. Merrett is free to play this weekend after the jury ruled that the offence was negligent and not reckless.